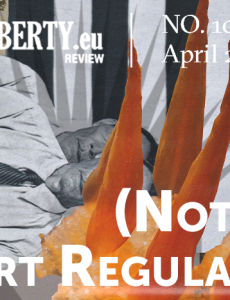 We trust that the tenth issue of 4libert.eu Review may act as both a reason for re-opening the discussion on what sets apart smart from fatuous regulation, and as an indicator of where the problems lie in the CEE region. Most readers will probably no longer wish to live in the Middle Ages, following these few examples. Too strange and different, the worldview of that age seems to be compared to that of today. And we also know the consequences of the tight regulation of all possible aspects of life in these times. The last time the Czech government conducted an analysis of how high and costly the bureaucratic burden was in the Czech Republic, the result was that the state required the business to meet almost 1,500 different information obligations. The official rhetoric of PiS government is “to make it possible to develop micro enterprises into small, small into medium, and medium into large or even into international champions”. However, the actual measures undertaken by the government were, in fact, to petrify the size of the companies. Out of thirty European countries, sixteen allow retail trade on Sundays, whereas fourteen do not limit retail opening hours on public holidays. The countries which regulate retail trade on Sundays and/or public holidays apply a range of exemptions. The liberalization of the Bulgarian power market has been characterized by constant external (the European Commission) and internal (private stakeholders) pressure. Regardless, the government has shown prevailing reluctance to take any serious actions.